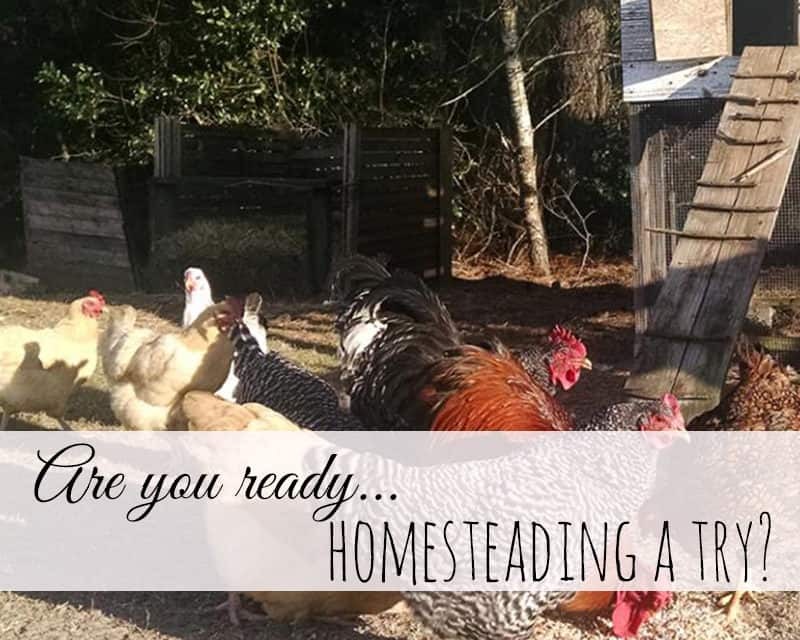 Are you ready to give homesteading a try? Typically we think of homesteaders as pioneers living on government free land forced to live a self-sufficient lifestyle. Today the land isn’t free and the choice to live a simpler life is being embraced by the homesteading movement. What’s so different today is those pioneers couldn’t rely on a grocery store, they didn’t have a car to drive them to the market, and when they had a hole in their shoe, they fixed it. They all knew how to repair a roof, mend clothes, give haircuts, make bread and if they wanted fresh eggs they raised chickens. They didn’t have fast food and their entertainment didn’t come from a little black box. Sunday church was the most important part of their week and they all looked out for their neighbors. Life was simple then. If you’re tired of relying on a pre-packaged lifestyle and are looking for ways to provide your family with healthy alternatives, homesteading may be for you. Give some thought to how much you rely on outside sources to provide your everyday needs. If you’re like most Americans you purchase your food from the grocery store, buy your clothes at the Mall and buy your energy and water from the city where you live. Do you dream of becoming more self-sufficient? Do you desire to use less energy, eat homegrown food, and improve the quality of your life for your family, community, and the environment where you live? If so, you have the heart of today’s homesteader. It doesn’t matter if you live on a farm surrounded by cows or in the city surrounded by people, it’s all about making wiser healthier choices. Your homestead is wherever you live and whatever you want it to be! Embrace the journey as it fits your life. If it means you make bread from scratch, raise chickens, plant gardens, or line dry your clothes it doesn’t matter because it’s all about the satisfaction you get from working hard and providing for yourself. There isn’t a one-size-fits-all definition. Modern homesteading begins with living within your means and learning to do things as close to the land as possible. Even if your home is in the city, you can shop at a local farmers’ market, buy fresh eggs and live by the “use it up, wear it out, make do, or do without” mentality. Today’s homesteader isn’t afraid of hard work or getting dirty and is always looking for ways to be more self-sufficient. Learn to become a producer, not a consumer. Your very first step in becoming a homesteader is to have a clear vision of your goals. Start by focusing on survival rather than consumerism. Look at your current living conditions. Where do most of your food, shelter, and energy come from? Look for ways you can start providing some of your most fundamental necessities and then outline a plan. Do what you can, where you are! I remember when we first started living a homesteading lifestyle I had a hard thinking I needed to do it all. I had to realize pretty quickly that I had a set of skills and talents different from everyone else and they didn’t include some of the things on my wish list. I would’ve loved to dig into some DIY projects, but I am not very good with a hammer, but I am a great baker and love to can jams and jellies. Personally, I had to realize that I couldn’t spend my life doing things that I wasn’t gifted at and I needed to concentrate on the things I loved doing and did well. Trust in your ability and don’t be afraid to be unique. No two homesteaders are the same! I encourage you to look at what you enjoy, what you’re good at, and then let that mold you into the homesteading life you desire. I often get asked how to start homesteading. My answer is always the same. Don’t wait for the perfect time, start right now. If you love to garden start small with container gardens if you want to learn to bake but aren’t sure you can tackle homemade bread invest in a bread machine. And if you want to start changing the way your family eats, shop at your local farmers’ market. Homesteading is a way of life; it’s about slowing down and developing healthy routines that help you return to your roots, just like the pioneers did. Homesteading is all about taking the time to enjoy life’s simple pleasures. 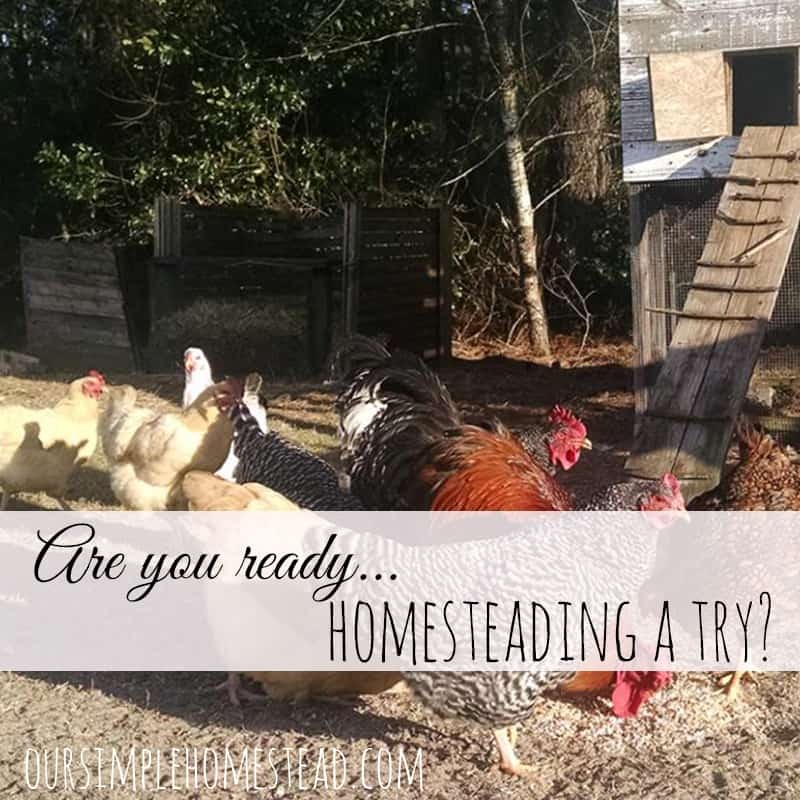 Are you ready to give homesteading a try? Take a walk out your back door and see what changes you can make to start a garden, add some backyard chickens and get in touch with the simpler side of you! What a great post. I couldn’t agree with you more. We live in suburbia right now, and we are still able to create a homesteader’s lifestyle by doing a lot of the things that you are espousing. It really is a state of mind, and if you wait until your circumstances are “perfect”, you could be missing out on a lot of living. Another perspective that I’ve come to embrace about homesteading has to do with the idea of doing it all for yourselves. You really don’t have to. You can choose what gives you the most joy and find others who have other gifts in the areas that you don’t like, and barter with them. That way, everyone is doing what they love and everybody’s quality of life is improved. There is something to be said for living a simple and interdependent life with like-minded folks. Everyone wins! Daisy I couldn’t have said it better myself. Thank for sharing your insight!! I too, want and try to do everything and then I get frustrated because I simply can’t do it all. I work a 40 hr week outside the home, not getting home until 5 every day, help take care of my 98 yr old mother who had a stroke and is in assisted living, plus garden, can or freeze the food and take care of a house, as well as maintain my mom’s house. Not enough hours in a day. But what relieves all my stress is when my bare feet hit the dirt of my garden and I see all those seeds turn into something beautiful and edible. Really good read! 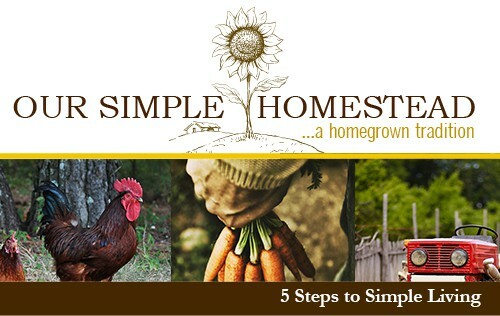 Lot’s of practical suggestions for doing what you can now to start on the homesteading Journey. I was reading that and thinking, “I do that!” Years ago I dreamed of being more self-sufficient, and ever since we moved to the country nearly ten years ago, I’ve kept adding more and more skills. It’s nice to realize how far I’ve come! I love how you broke this down. i appreciate the fact that homesteading looks difrent for everyone. I am starting to make more and more from scratch and love to bake bread. Our years is small so I won’t be able to raise animals but support my friends who do.